Federal Hill is an historic and environmentally sensitive site on the Ramapo Fault on the eastern edge of the Highlands. The eastern slope has been mined for crush stone since 1957. The western slope is a pristine, upland forest, with many endangered species, exceptional resource value wetlands, and critically important trout streams. It is also the site of the Federal Hill Rebellion, or Pompton Mutiny, where General Washington had ordered the summary execution of the two leaders of the 300 strong mutineers from the New Jersey Line of the Continental Army, thus quelling the rebellion. Since as early as 1989, the 180 acre site occupying the western slope has been earmarked by the Borough of Bloomingdale for open space preservation.The designation was reflected in the Borough's Master Plan; in its submissions to the Highlands Council for Planning Area conformance; in its successful petition to the State Planning Commission to designate the site from Suburban PA2 to Environmentally Sensitive PA-5; and reflected in a Court-ordered settlement of a builder's remedy lawsuit. In addition, the site is on the Passaic County Open Space Master Plan. Like many municipalities in the Highlands and elsewhere in the State, with decreasing levels of State fiscal support, decreasing tax revenues and increasing costs of municipal services, the Borough is having a difficult time maintaining services without raising property taxes. But unlike many similarly fiscally pinched towns in New Jersey, it is about to cash in on our hugely valuable natural and cultural resources, a short term fix with permanent, devastating consequences. 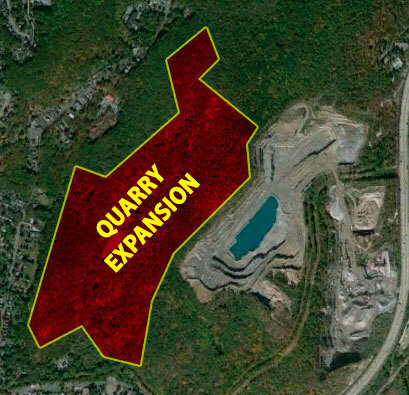 On Tuesday evening at 7:00PM the Bloomingdale Borough Council will vote on the proposed Quarry Overlay Zone, which will allow the current quarry operator, Tilcon, to expand its quarry operation, to surpass Federal Hill's summit, and on to the western slope and the 180 acre site, eventually obliterating the entirety of the mountain, extinguishing all natural and cultural resource values, in exchange for the grading and the donation of a 35 acre site for an inclusionary development. The Pequannock River Coalition has prepared an excellent, insightful presentation on the issue HERE. Join with citizens of Bloomingdale and surrounding communities, the New Jersey Highlands Coalition and other organizations in opposing this destructive action! Whether you choose to comment, or just be counted, your presence counts!